Learning about DIY woodworking can provide you with a valuable set of skills. Even if you do not plan on doing this type of work professionally, you have a range of woodworking ideas that can be great for repairing and building things around the house. Of course, it’s important to have the right woodworking tools when you’re looking to start a project. Having tools like the BladeRunner X2 Portable Table Top Saw will go a long way toward helping you get the best results from your projects, but there are several woodworking tips and tricks you will need to learn along the way. If you are new to woodworking DIY projects, this is the time when you are most likely to make mistakes that can set you back. To help you avoid these common mistakes, we are going to share some of the best woodworking tips for beginners. These woodworking tips and tricks include having the right side of the wood face up, using the right blade, remembering the kerf, selecting the right fasteners, and knowing about different types of wood glue. Cutting material like plywood and particleboard can be difficult. Even when you are working from a stable work support, it can be difficult to avoid the splintering that can occur as the blade makes its way through the material. One of the best woodworking tips for beginners is knowing which side of the wood to cut. 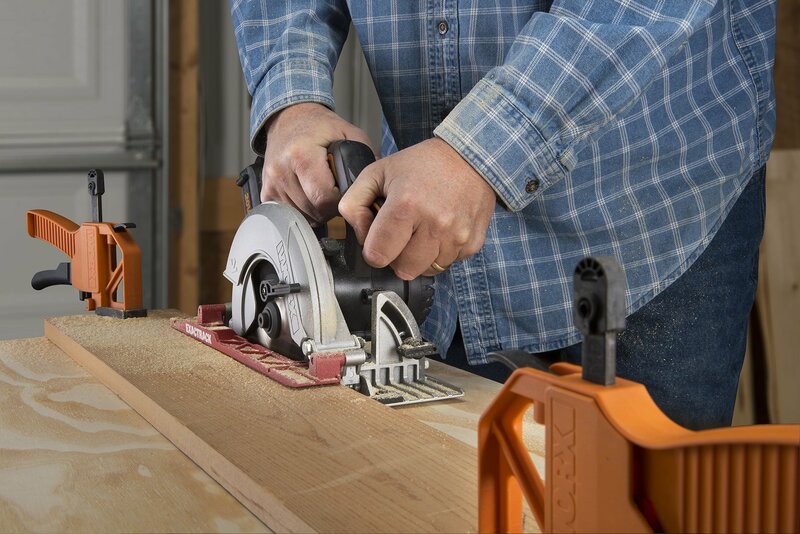 If you are working with a tool like the WORX 20V ExacTrack 6-1/2” Circular Saw, you want to cut with the side that is going to be visible on the finished product facing down. That way, if any splintering does occur, it will be on the side that is unseen. The opposite is true if you are using a table saw. If you have a side you want to keep looking good, making sure it is facing up when you cut on your table saw. One mistake that many DIY woodworking beginners make is to leave the stock blade in their circular saw and use it for everything. This is usually an 18-tooth or 24-tooth framing blade. While these blades will make cuts, different blades serve different purposes. Knowing how to choose the right blades is one of the most important steps to learning how to do woodworking. You have blades with finer teeth for making cleaner cuts and circular saw blades that will work better for jobs like cutting plywood. Along with that, you need to switch to different blades for tasks like ripping and cross-cutting. One of the best woodworking tips for making accurate cuts is to account for the blade kerf. The kerf is the thickness of the cut. If you don’t account for it, your measurements will be off because of the material that gets removed when the blade is making the cut. The first tip is to make all of your measurements separately. Measure the length you need, make the cut, make the next measurement, and so on. Another of our favorite woodworking tips is to not cut right on your mark. If your mark represents the length you need the piece to be, you want to cut on the far edge of the line on the side that is being removed. Using a 20V Cordless Drill & Driver or a Cordless Impact Driver can make it easier to drive fasteners like screws. However, selecting the right fasteners is an important part of getting your DIY woodworking job done right. Depending on your woodworking ideas, it’s important to pick the right fastener for your project. You probably already understand how the thickness and length of the fastener can be important, but you also need to consider the difference between plain steel and galvanized screws. If you are working on something that is going to stay outside, galvanized fasteners can prevent things like rust stains and corrosion. If you are serious about your woodworking ideas, you are probably going to need to use wood glue on a lot of projects. While glue can play an important role in a wide range of DIY woodworking tasks, you need to know which type of glue to use for different projects. For most woodworking DIY projects, standard wood glue will work well, but in some cases, you may need to consider water-resistant or waterproof wood glue. If the piece is going to be indoors, but in a place where it is likely to get wet, you should use water-resistant glue. If you are making something that is going to stay outdoors, you want to go with waterproof wood glue. When you start learning how to do woodworking, you are bound to make some mistakes. It takes time to develop these skills. With the woodworking tips and tricks we have here, you can avoid many of the most common mistakes that cause problems for those who are new to working with wood. Find the best woodworking DIY tools at WORX! Have the right side of the wood face up, use the right blade, remember the kerf, select the right fasteners, and know about different types of wood glue.